Pinckney Bend Distillery is NOW producing field-to-glass heirloom whiskey made from rare, historically important heirloom corn varieties. Fall 2017: We are excited to announce that we will be releasing this year’s variety, Pencil Cobb, Early Fall 2017. It will be available at the Distillery and select Missouri retail locations. Late Autumn, 2016: We launched the Heirloom Whiskey Program two years ago and the first three expressions; Hickory Cane, Wapsie Valley and Missouri Meerschaum Pipe Corn have just been released. Patrons who purchased Heirloom Whiskey Futures can now exchange their certificates for boxed sets at the distillery. Individual 375mL bottles are available, though supplies are limited. Photo: A trio of our just-released heirloom varieties. History In A Glass: Why Heirloom? Pinckney Bend’s Pencil Cob seed corn. 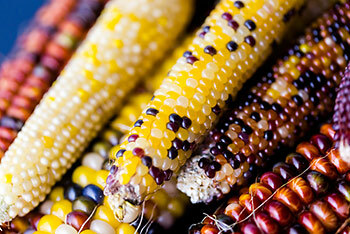 There is no established date for when a corn variety becomes heirloom. Some varieties such as blue corn have been grown and used by Native Americans for centuries. Others were developed as late as the early 20th century. Heirloom varieties all have three things in common. They are; 1. open pollinated, 2. no longer grown on a commercial scale, and 3. genetically quite different from today’s hybrid and GMO corns. 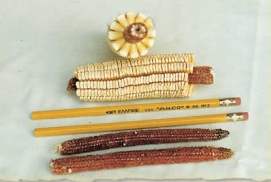 Heirloom corn varieties are often (but not always) associated with specific geographic areas. They are also associated with specific characteristics. In the 19th Century pioneers grew the corn that they brought with them. Over time some varieties performed better than others, and farmers in a given area often came to grow the same varieties as their neighbors. However, every farmer selected seed corn from his own fields for planting the following year. In this respect, every farmer became a hybridizer, and there is often considerable variability within specific heirloom varieties. Planting Hickory Cane corn in the test plot. Propagation and test plot sites will be located on adjoining vacant lots on Front Street, only 100 feet from the distillery. This is excellent river bottom ground, which has not been cropped in more than a century. Two 12′ x 12′ plots will be established, providing seed for the following year’s one-acre production fields. With optimized fertility, moisture, weed and insect damage control, these plots will each produce about 1.5–2 bushels of shelled corn. This is enough seed corn for planting, plus sufficient spare grain for several 10-gallon test batches of mash. 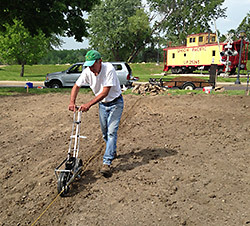 Propagation plots will be managed, planted and maintained Master Gardner Greg Newell. Production fields will be grown in partnership with a local farmer who has the land, equipment and experience necessary to grow open pollinated corn varieties. We will not be seeking organic certification for this whiskey. 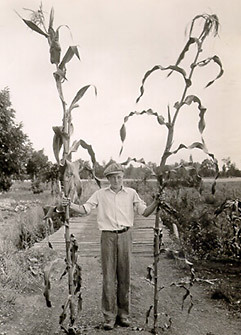 One acre of heirloom corn should produce from 70–80 bushels of shelled corn (compared to 140 for GMO seed). The same production variables apply to production fields, with the addition of deer and raccoon damage. Producing heirloom whiskey requires mashing, fermenting and large volume, first cut distilling capabilities that Pinckney Bend Distillery does not currently have. While our primary goal here is to produce commercial quantities of heirloom corn whiskey, we also intend to keep this new equipment busy producing a Missouri malt whiskey from barley. Other specialty grains we plan to experiment with include wheat, oats, millet and quinoa. In short, the new equipment opens a whole new world of possibilities. Prepare test plots, acquire seed, and identify growers. 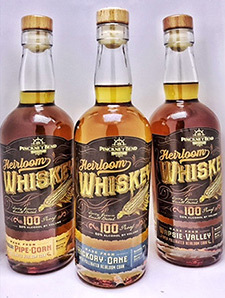 Begin pre-selling three bottle sets and offering Heirloom Corn Whiskey Notes. Purchase and install new equipment. Begin tests using commercially available corn. Plant test plots and production field. Harvest corn at production plot and begin making Pencil Cob heirloom whiskey. Purchase barrels and begin aging first heirloom batch. Begin the process again with another heirloom variety. Release first Pinckney Bend Heirloom Whiskey.